Thank you, Jessette…wow, what a lovely compliment! It made my day! Such a brilliant and fun way of illustrating the concept of "Hurry!" 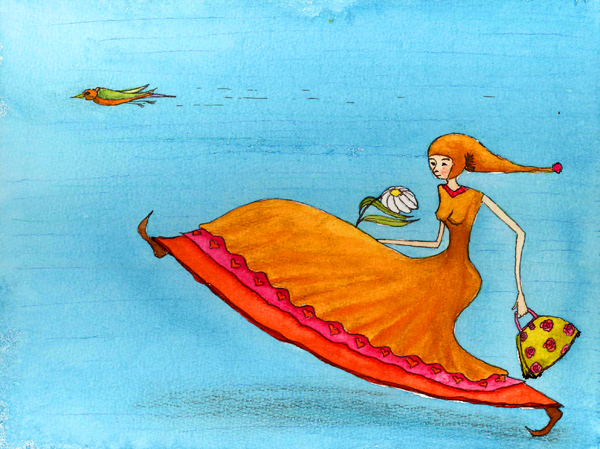 I love the bird and the suitcase and the hurry! Thank you…I love these colours as well…..
hehehhee….so good that we can draw the things we'd like to do in real life, but cant, isn't it?! I'm drawn to this character! Love the expressive streeeetch! She is definitely gorgeous! And the colours are too. Love her giant step, great sense of movement. Wow the colours are gorgeous! Lovely colors and I love the outfit! Such a funny character!